Enjoy an effortless way to pay. Add your TFCU credit cards or MoneyPlusTM card to your digital wallet and shop securely in-store, in-app or online with your mobile device. Shop Securely. Pay Effortlessly. With TFCU Digital Wallet Options. 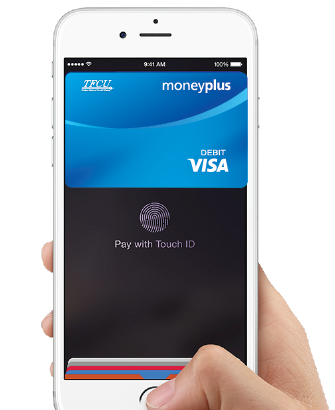 Use Apple Pay with your TFCU credit cards and MoneyPlus™ card to pay the easy, secure, and private way at thousands of participating stores and apps. 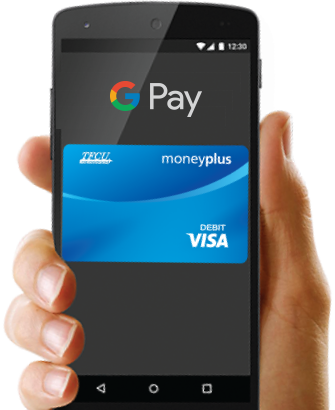 There’s a lot to love about Google Pay. Like how you can enjoy the confidence of paying with your phone using your favorite TFCU card. 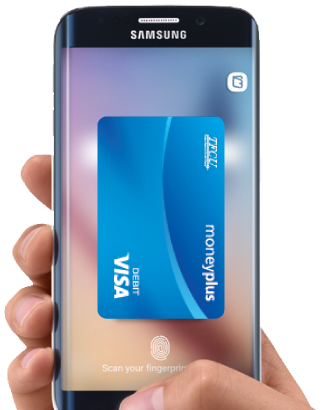 Samsung Pay makes paying with your phone fast, easy and convenient. Whether you’re at the local convenience store or your favorite boutique – you’re good to go. Apple, the Apple logo, iPhone, and iPad are trademarks of Apple Inc., registered in the U.S. and other countries. Apple Pay, Touch ID, iPad Air, and iPad mini are trademarks of Apple Inc.